Since it opened in 1993, Fuel Cafe has been the unofficial center of Riverwest. On a recent afternoon, police officers stopped in for coffee to go, visiting train-hopping punks did crossword puzzles, a middle-aged couple sat down for lunch, and Slava, a local street musician and well-known regular, nursed his coffee for well over three hours. Now, after more than ten years with only minimal changes, Fuel is about to undergo a major renovation, adding a restaurant, a bar, and outside seating in the back. Co-owners Scott Johnson and Leslie Montemurro are in the process of purchasing the building and the junk store next door, including the upstairs, basement, garage, and the parking lot in the alley. 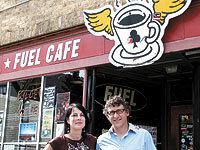 Co-owner Scott Johnson discussed the changes over a cup of coffee at Fuel. “Fuel will always be a cafe,” he said. “It’ll always have the same look, the biker thing, the recycled materials. It’s not going to be a fancy place.” The renovated cafe will serve breakfast, lunch, and dinner. Although the menu has yet to be developed, Johnson said it will be “comfort food,” and will probably include eggs, pancakes, breakfast burritos, hamburgers, and lots of vegetarian and vegan options, perhaps including mock chicken — a popular menu item at the Palomino, a Bay View bar and restaurant also owned by Johnson and Montemurro. “This won’t be the place you go to go out to dinner,” Johnson said. “It’ll be more the kind of place you go to just grab something to eat.” Johnson said the menu will be affordable — with most or all items under $10. Local suppliers will be used “as much as possible,” but the emphasis will be on keeping prices low. The current cafe will remain, although it may decrease in size as the kitchen is pushed forward. “We’ll still be doing a lot of coffee to go,” Johnson said. A plan to add a juice bar is also in the works. Johnson and Montemurro plan to turn the current garage into a dining room, with skylights and lots of windows. The bar, pending approval of a liquor license, will be in the back. The parking lot behind the cafe will be turned into outdoor seating. The current wall that divides the cafe from the junk store will remain, Johnson said, but most of the architectural details have yet to be worked out.